We are back again with another Python tutorial. Did you remember the other ones? 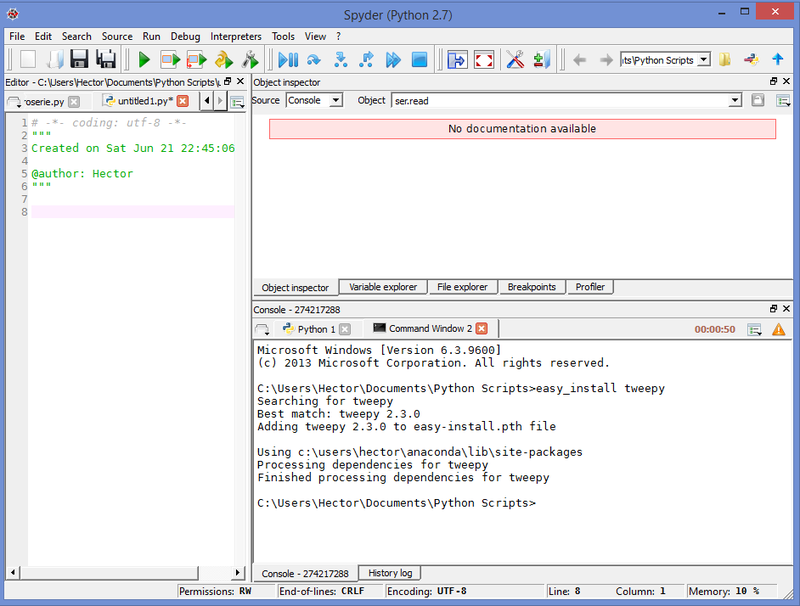 maths with Python 4: Loading data. Raspberry Pi 001: Setup and Run first Arduino-Python project. 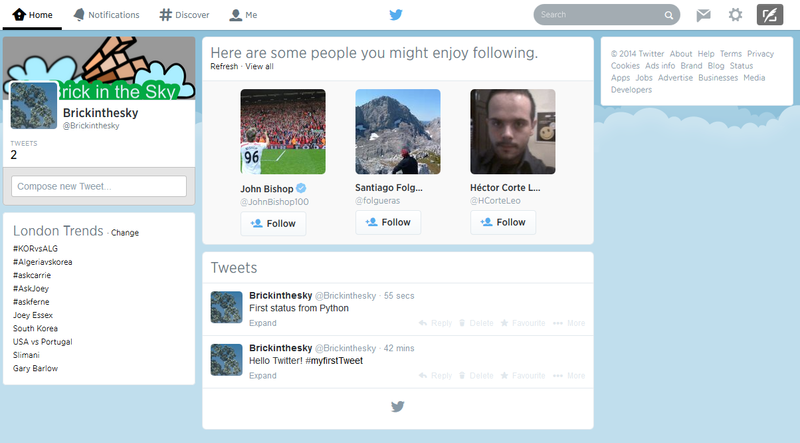 In this one we are going to work with Twitter API and Python. First of all, what is an API? In short, an API is a library that allows one software to communicate with another software/hardware. 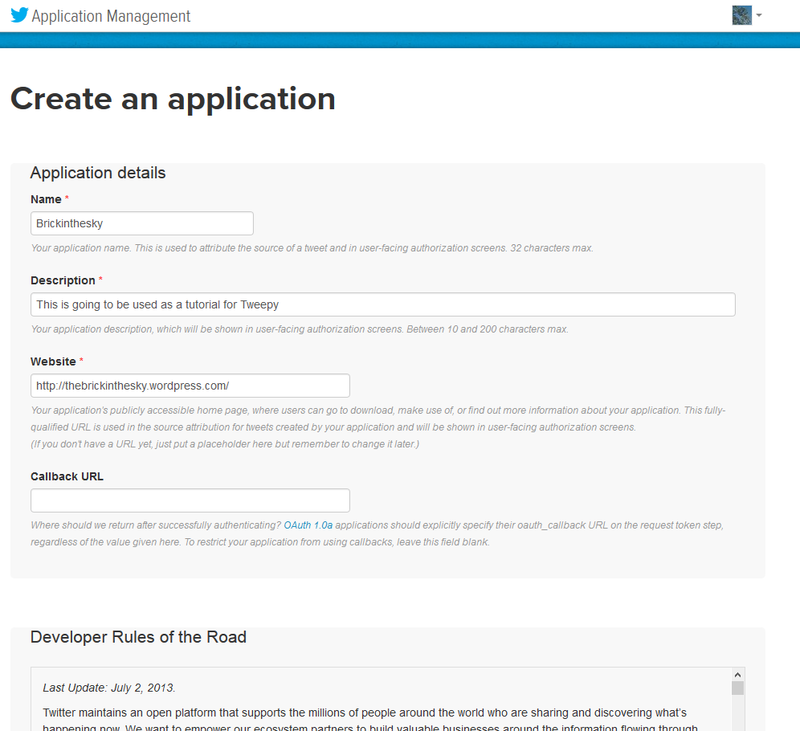 In this case, Twitter API allows to communicate with “Twitter” thinking of Twitter as a software. Second, for what coding languages there is libraries? This question depends on the developers and changes quite a lot. In the Twitter Developers webpage there is a list of the available libraries for different languages (that doesn’t mean there is no more than those, possible there is thousands made by amateurs but are not updated regularly). Here we are going to work with Tweepy, but you can try with any of the others, they should work in similar way. It should install the library without any problems. 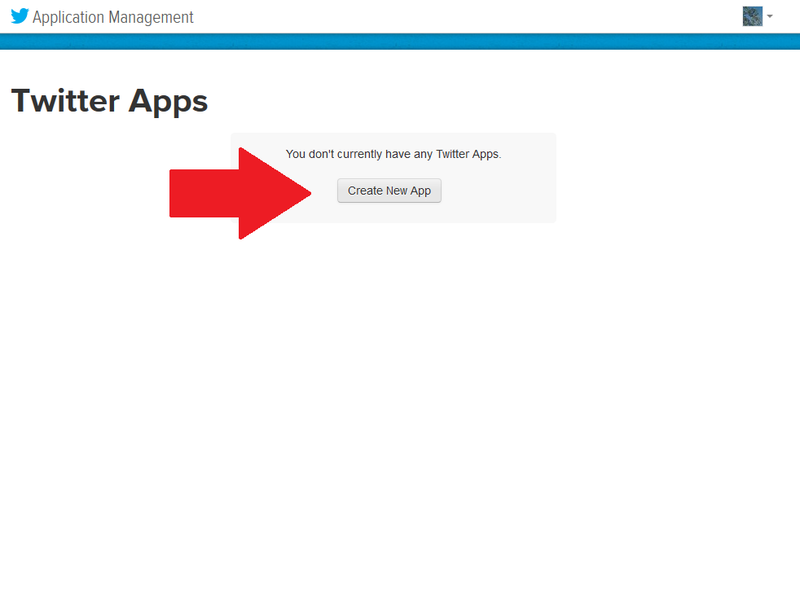 step 2: Get a Twitter account (You can skip this step if you already have one). I made @Brickinthesky for that. 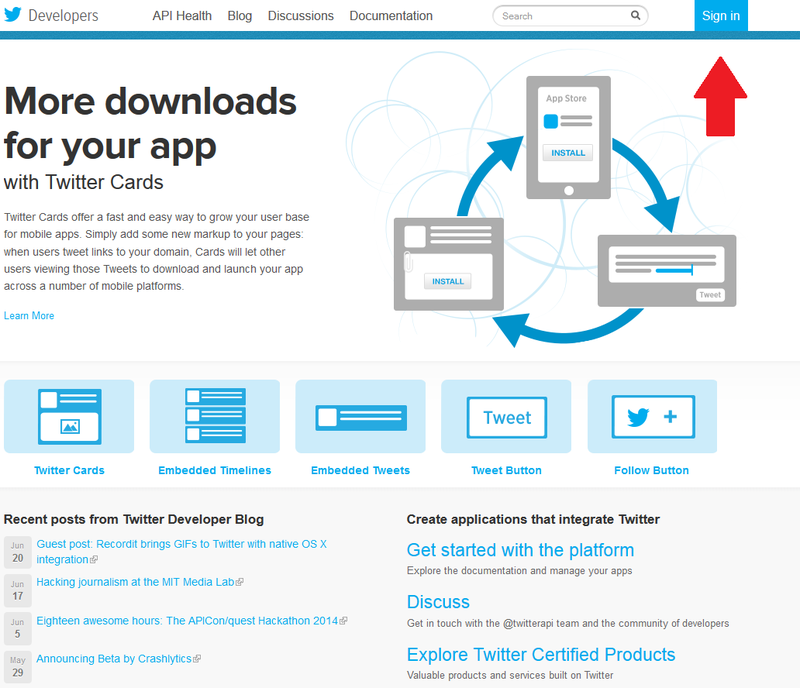 step 3: Go to Twitter Developers webpage and get a code to access Twitter through the API with your Twitter account. 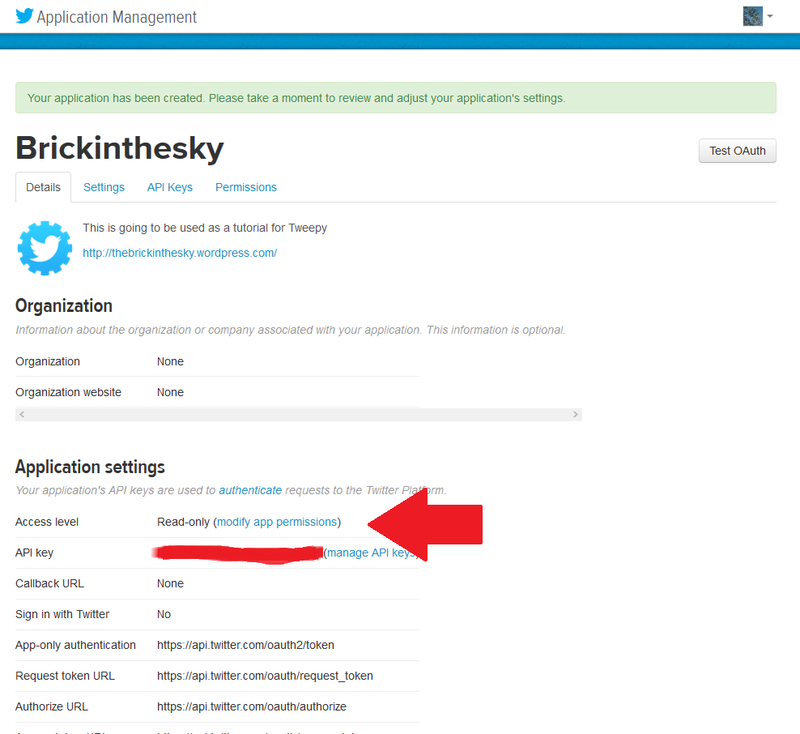 First you need to Sign in with your Twitter account. 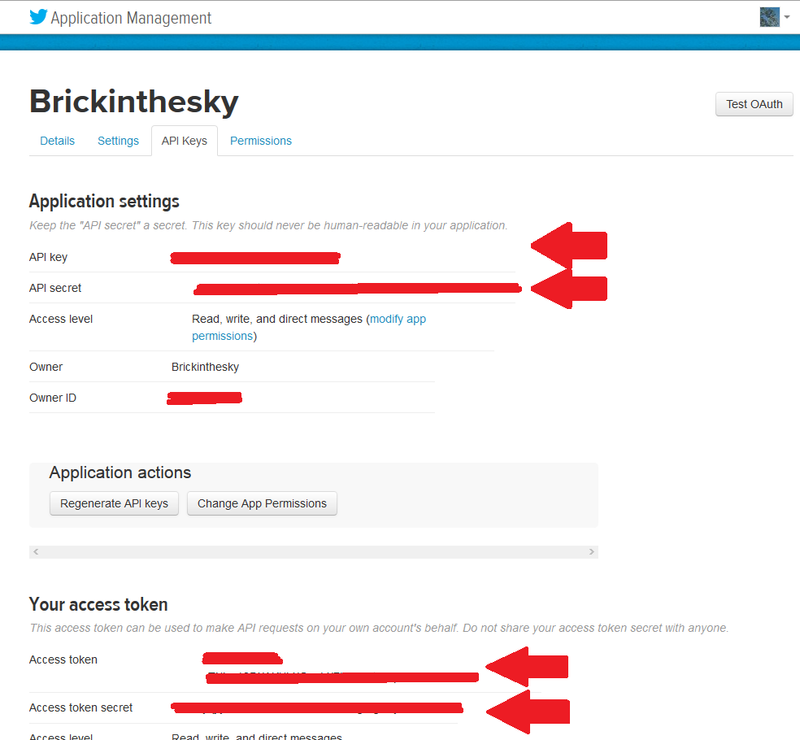 Once Signed in, you can click in “My applications” to create the key codes. 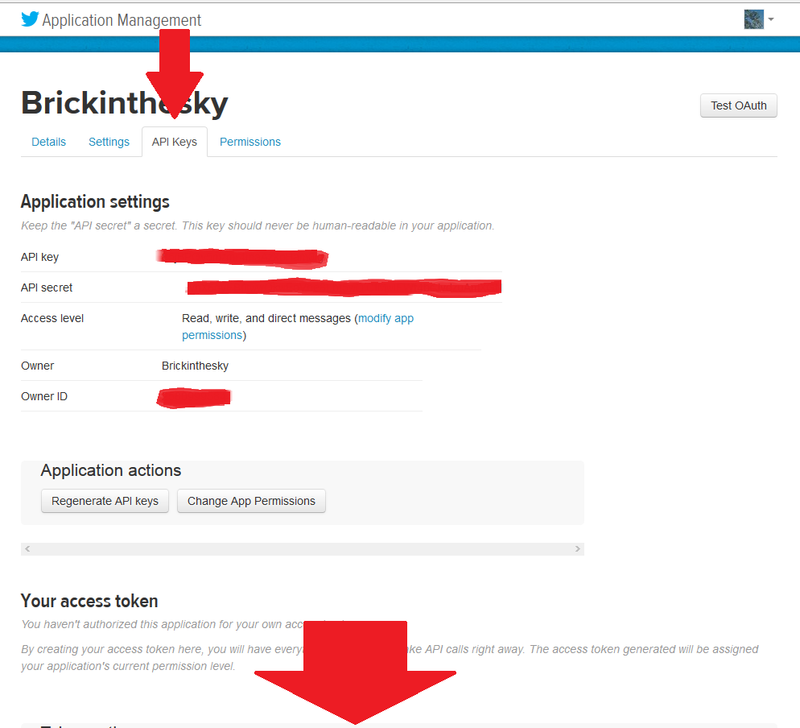 Since it is the first time you try to use the API, there is no Apps so, just click and create a new one. Fill the requested details and don’t worry too much if you don’t know what to put there. For instance the website says it can be changed later. See the red arrow? It indicates a field you need to change in order to be able to send and receive data from Twitter. Click on it and change to Read and Write. Update the settings and click in the API Keys. Here scroll down to “Create my access token”. Possibly you will need to wait a little bit… and update. 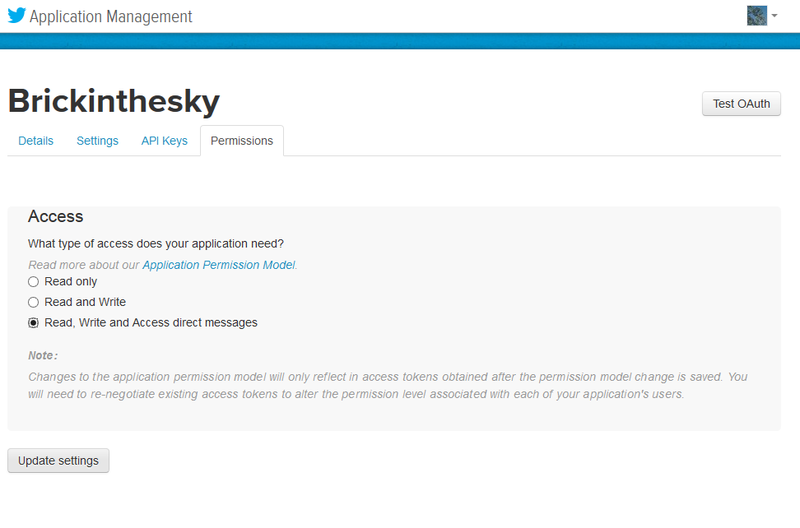 And… here they are, the API key and secret, and the access token and secret. 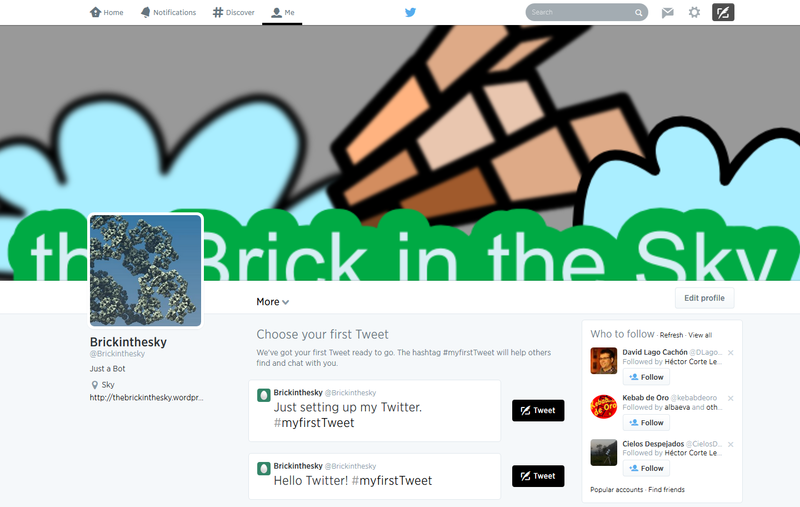 step 4: Get the tweets in your public timeline. Go back to Python and with this code (where you have to use your API key and Token key) you will be able to see your timeline. 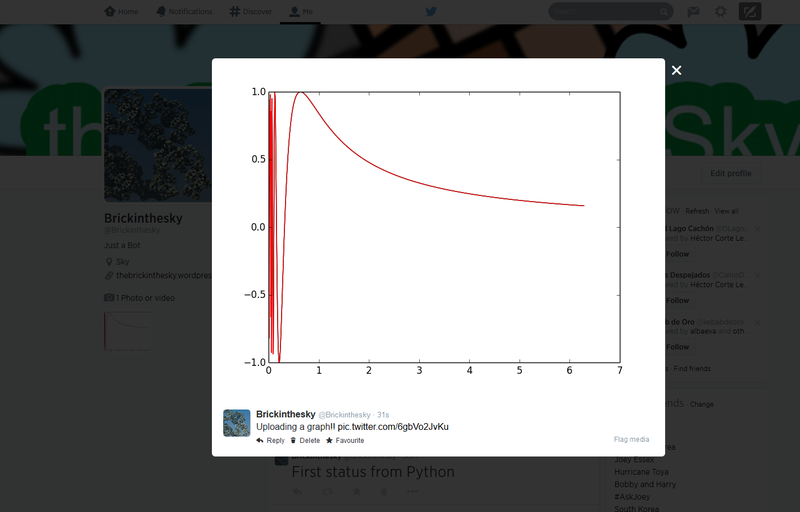 And the result is the tweets in your timeline will appear in Python. step 5: Let’s get the tweets from another account. 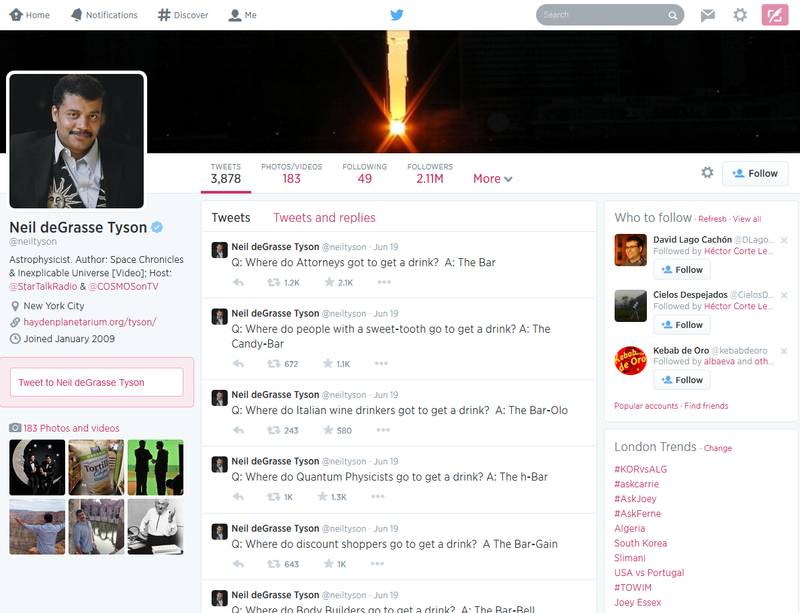 Let’s try Neil deGrasse Tyson which Twitter looks like this right now. # Now, instead of getting your own tweets we are going to gather another users tweets. 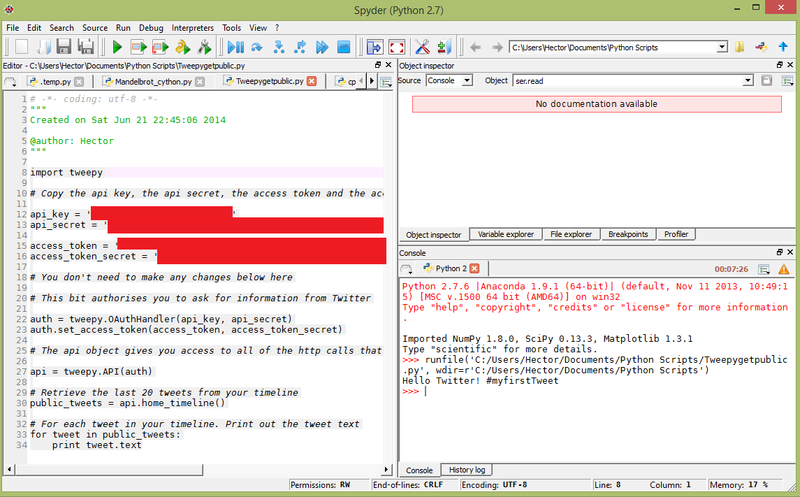 step 6: Now let’s publish something in Twitter using Python. 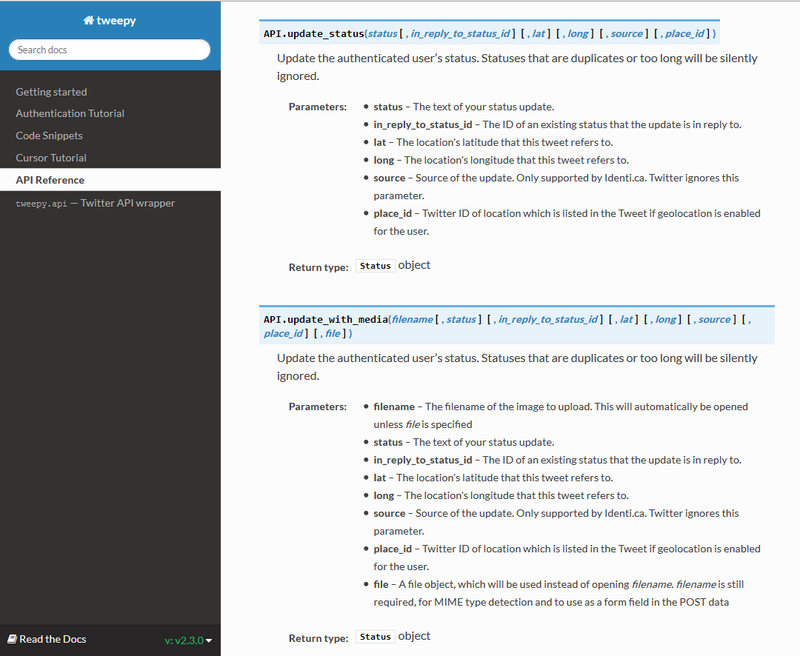 For that I know that the correct instruction is “api.update_status” but I don’t know how to use it, so lets look at the API reference. Hmmm it looks quite simple, just…. and it appears in Twitter. And this is the result. Isn’t it cool? step 8: Networks. Basically we want to see how the followers of somebody are related. To do that we are going to use…. the free open-source software for networks visualization…. Getphi. 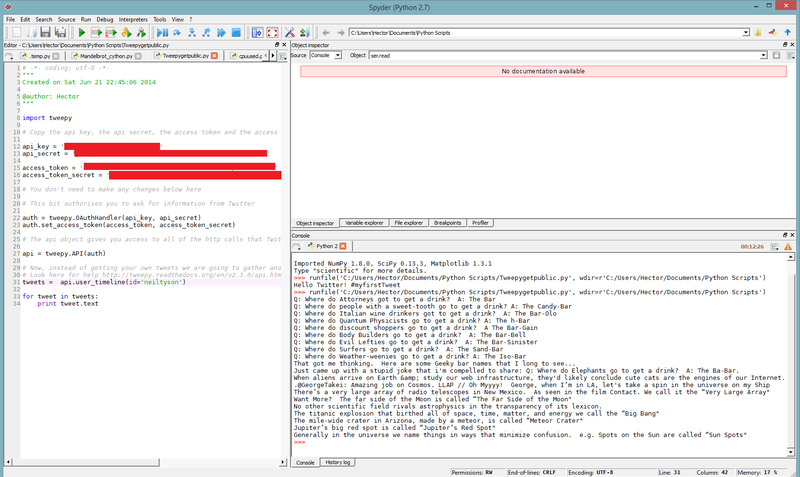 And now we need to know how to generate files for Gephi using Python. Go to Gephi and open it. (Ignore warnings, just hit Ok button). 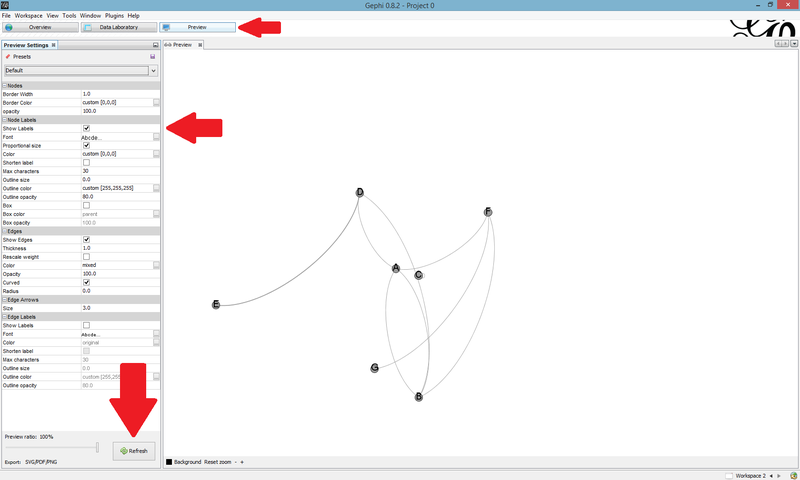 To display the graph… go to Preview, add the names of the nodes and update… and voilà! 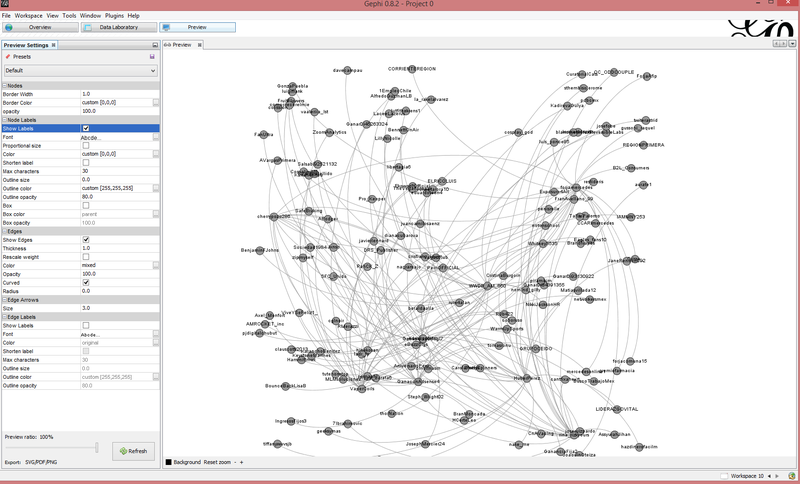 And once loaded in Gephi… voilà!!! 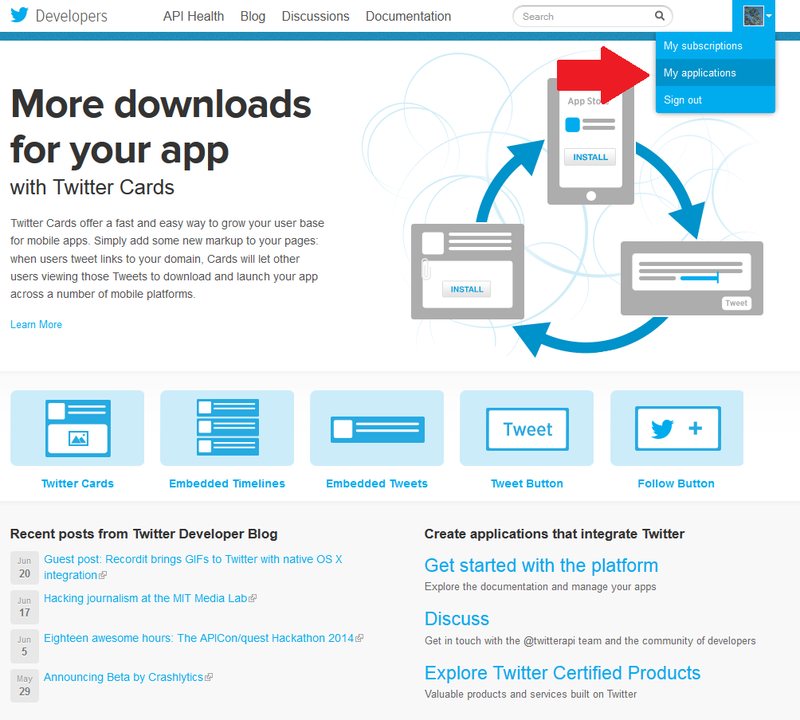 Hope you like this very long post and helped people get used to work with the Twitter API. I was trying to retrieve data from the National Weather Service for another post when I found a protocol. The protocol is called SOAP (Simple Object Access Protocol). In simple words, It defines an standard procedure to communicate information between different computers over internet. (I’m not an expert, so I’m basically learning while writing this). I’m trying to keep it as low and understandable as possible. Now, how to create this SOAP documents? Well, in fact there is an easy way for HOME to create the SOAP document for sending it to DATA_SERVER. A part from SOAP, we have WSDL (Web Services Description Language). WSDL is a XML document that describes all the instruction that a machine/program can accept and how to call them. Basically WSDL is a document to tell HOME what kind of instructions to send to DATA_STORAGE inside the SOAP document. At the same time, it is standard and it’s usage can be automated, so you can have a program in HOME computer that analizes data from internet sources. If a new source appears it will have it’s own WSDL document telling you how to access it’s data using a SOAP document. You simply download that WSDL document and asks your computer to generate the code. Ok ok, sounds nice… AN EXAMPLE PLEASE!!!! The description I just made is a little bit simple, but should be enough to understand how this things work. In the end, there is a set of nodes, paths, intermediates… that read the SOAP documents, interpret them and redirects everything. The currency exchange WSDL will tell our program (in this case MATLAB) how to ask for the actual currency exchange. When we click on the link… We acces a webpage with the WSDL link. Now go to MATLAB. The documentation that will help us is Access Web Services Using MATLAB SOAP Functions. Step 2: Use the WSDL file to create a MATLAB class. It will create a folder for the class on your working directory (it will be named @CurrencyConvertor). Step 3: Create an object of the new class (the creation name of the class will be the name of the directory, which will have a m-file inside with the same name, the rest of m-files will be procedures to be used with the object ). I cannot explain here what a class in MATLAB means, but suppose you want to create vectors and tell MATLAB how to work with a vector. You will define the class vector which has fields, properties etc… in the simple case, just a set of numbers. Then appart from that definitions, you define procedures to work with vectors. One procedure will be for instance how to add 2 vectors (for instance adding together the set of numbers). This one will tell us how to get real data from the stock exchange. I think many people will find this one extremely interesting. Step 4: Get the stock value of IBM. As before, checking the class folder we see that GetQuote.m is the file to get the data. This string can be scanned very easily to get only the desired data. For the last example I’m going to use a different web. It’s called Xmethods and it’s a repository for WSDL links. Basically this is going to take 2 urls to 2 images and compare them and give a number. The closer to zero the closer are the images. Step 2: Create the class and one object of the class. To be honest…. I think it is more usefull in terms of knowing if the image is exactly the same, but not so good for comparison. Hope you like this short introduction. What I showed you was very nice… but It could be even better. Think about it commercially. Ignite is the answer. Ignite is the same as WebserviceX.NET but commercial, that means that you will have access to many more data bases and information. Energy demand, currency income into companies, news headlines… but of course you have to pay to get that information. You need to use a login in your SOAP files.